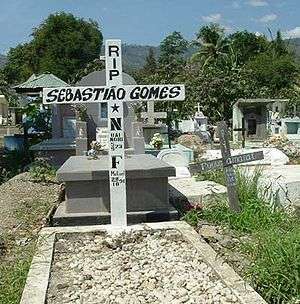 The East Timorese genocide refers to the pacification campaign(s) of state sponsored terror by the Indonesian government during their occupation East Timor. Oxford university held an academic consensus calling the Indonesian Occupation of East Timor genocide and Yale university teaches it as part of their "Genocide Studies" program. The failure of successive Indonesian counterinsurgency campaigns led the Indonesian military elite to instruct the commander of the Dili-based Sub regional Military Resort Command, Colonel Purwanto to initiate peace talks with FRETILIN commander Xanana Gusmão in a FRETILIN-controlled area in March 1983. When Xanana sought to invoke Portugal and the UN in the negotiations, ABRI Commander Benny Moerdani broke the ceasefire by announcing a new counterinsurgency offensive called "Operational Clean-Sweep" in August 1983, declairing, "This time no fooling around. This time we are going to hit them without mercy." The breakdown of the ceasefire agreement was followed by a renewed wave of massacres, summary executions and "disappearences" at the hands of Indonesian forces. In August 1983, 200 people were burned alive in the village of Creras, with 500 others killed at a nearby river. Between August and December 1983, Amnesty International documented the arrests and "disappearances" of over 600 people in the capital city alone. Relatives were told by Indonesian forces that the "disappeared" were sent to Bali. The testimonies of foreigners at the cemetery were quickly reported to international news organisations, and video footage of the massacre was widely broadcast internationally causing outrage. In response to the massacre, activists around the world organised in solidarity with the East Timorese, and a new urgency was brought to calls for self-determination. TAPOL, a British organisation formed in 1973 to advocate for democracy in Indonesia, increased its work around East Timor. In the United States, the East Timor Action Network (now the East Timor and Indonesia Action Network) was founded and soon had chapters in ten cities around the country. Other solidarity groups appeared in Portugal, Australia, Japan, Germany, Malaysia, Ireland, and Brazil. Coverage of the massacre was a vivid example of how growth of new media in Indonesia was making it increasingly difficult for the "New Order" to control information flow in and out of Indonesia, and that in the post-Cold War 1990s, the government was coming under increasing international scrutiny. A number of pro-democracy student groups and their magazines began to openly and critically discuss not just East Timor, but also the "New Order" and the broader history and future of Indonesia. Although Cribb maintained that the Portuguese census was almost certainly an underestimate, he believed it to be more likely correct than the church census, due to the fact that any church attempt to extrapolate the size of the total population "must be seen in light of its incomplete access to society" (less than half of Timorese were Catholic). Assuming a growth rate in line with the other nations of South East Asia, then, would yield a more accurate figure of 680,000 for 1975, and an expected 1980 population of slightly over 775,000 (without accounting for the decline in the birth rate resulting from the Indonesian occupation). The deficit remaining would be almost exactly 200,000. According to Cribb, Indonesian policies restricted the birth rate by up to 50% or more, thus around 45,000 of these were not born rather than killed; another 55,000 were "missing" as a result of the Timorese evading the Indonesian authorities who conducted the 1980 census. A variety of factors—the exodus of tens of thousands from their homes to escape FRETELIN in 1974-5; the deaths of thousands in the civil war; the deaths of combatants during the occupation; killings by FRETELIN; and natural disasters—diminish further still the civilian toll attributable to Indonesian forces during this time. Considering all this data, Cribb argues for a much lower toll of 100,000 or less, with an absolute minimum of 60,000, and a mere tenth of the civilian population dying unnaturally, for the years 1975–80. 1 2 Kiernan, p. 594. 1 2 Payaslian, Simon. "20th Century Genocides". Oxford bibliographies. ↑ "Genocide Studies Program: East Timor". Yale.edu. ↑ Quoted in Budiardjo and Liong, p. 15. ↑ Quoted in Ramos-Horta, p. 108. ↑ Quoted in Taylor (1991), p. 68. ↑ Taylor (1991), p. 68. ↑ Taylor (1991), p. 69; Dunn (1996), p. 253. ↑ "A Quarter Century of US Support for Occupation: National Security Archive Electronic Briefing Book No. 174". ↑ Taylor (1991), p. 71. ↑ Quoted in Turner, p. 207. ↑ Indonesia (1977), p. 16. ↑ Indonesia (1977), p. 21. ↑ Indonesia (1977), p. 19. ↑ CAVR, ch. 7.3, pp. 41–44. ↑ Deborah Mayersen, Annie Pohlman (2013). Genocide and Mass Atrocities in Asia: Legacies and Prevention. Routledge. p. 56. ↑ Taylor (1991), pp. 92–98. ↑ CAVR, ch. 7.3, pp 146–147. ↑ CAVR, ch. 7.3, p. 146. 1 2 Kohen and Taylor, pp. 54–56. ↑ CAVR, ch. 7.3, p. 72. ↑ Quoted in Taylor (1991), p. 97. ↑ Taylor (1991), p. 203. 1 2 Taylor, pp. 101–102; Nevins, p. 30; Budiardjo and Liong, pp. 127–128; Amnesty (1985), p. 23; Dunn, p. 299. ↑ Budiardjo and Liong, pp. 41–43; Dunn (1996), p. 301. ↑ Dunn (1996), pp. 303–304. ↑ Amnesty (1985), pp. 53–59; Turner, p. 125; Kohen and Taylor, p. 90; Budiardjo and Liong, pp. 131–135. ↑ Amnesty (1985), pp. 53–54. ↑ Amnesty (1995); Winters; Budiardjo and Liong, p. 132; Jardine, pp. 33–34; Aditjondro (1998). 1 2 Amnesty (1995), p. 14. ↑ Aditjondro (1998), pp. 256–260. ↑ Taylor (1991), pp. 158–160. ↑ Two soldiers were stabbed under disputed circumstances. (Schwarz (1994), p. 212; Pinto and Jardine, p. 191.) Soldiers said the attacks were unprovoked. Stahl claims stabbed Officer Lantara had attacked a girl carrying the flag of East Timor, and FRETILIN activist Constâncio Pinto reports eyewitness accounts of beatings from Indonesian soldiers and police. Kubiak, W. David. "20 Years of Terror: Indonesia in Timor – An Angry Education with Max Stahl". Kyoto Journal. 28. Reprinted at The Forum of Democratic Leaders in the Asia-Pacific. Retrieved 14 February 2008. ↑ Carey, p. 51; Jardine, p. 16. The Portuguese solidarity group A Paz é Possível em Timor Leste compiled a careful survey of the massacre's victims, listing 271 killed, 278 wounded, and 270 "disappeared". ↑ Jardine, pp. 16–17; Carey, pp. 52–53. 1 2 Jardine, pp. 67–69. ↑ "About ETAN". East Timor Action Network. Retrieved 18 February 2008. ↑ CIIR, pp. 62–63; Dunn, p. 311. 1 2 Friend (2003), p. 433. ↑ Schwarz (1994), pp. 216, 218, 219. ↑ Conflict-related Deaths in Timor Leste, 1954–1999. The Findings of the CAVR Report Chega! ↑ Chega! The CAVR Report Archived 13 May 2012 at the Wayback Machine. ↑ How many deaths? Problems in the statistics of massacre in Indonesia (1965–1966) and East Timor (1975–1980). Works.bepress.com (15 February 2008). ↑ Jardine; Taylor (1991), p. ix; Nevins cites a wide variety of sources discussing the question of genocide in East Timor, on p. 217–218. ↑ Saul, Ben. "Was the Conflict in East Timor ‘Genocide’ and Why Does It Matter?". Melbourne Journal of International Law. 2:2 (2001). Retrieved 17 February 2008. ↑ Budiardjo and Liong, p. 49; CIIR, p. 117.